Rivoli Opens - Alexandra Street's latest venture open its doors on 31st May 1920. The first movies to be shown were the Swedish silent movie 'Flame of Life' and A Little Child Shall Lead Them'. On 26th July 1920 the cinema was hit by a fire when the red curtain to the side of the stage burst into flames. The staff of the cinema managed to extinguish the flames, amazingly the packed audience stayed to watch the action unfold and the orchestra drenched by the actions of the fire fighting played on. The building has moved between being a theatre to a cinema and back again over the years, more recently the New Empire Theatre. This has now closed and new usage possibilities are being explored. Coleman Estate Starts - Just south of the A127 a large sweep of houses started to be erected in this year, expanding not only the boroughs boundaries but also its population. Frank Matcham Dies - Matcham (1854-1920) has been called ‘the most prolific theatre architect of all time. His lavish work can be found throughout the country, his masterpiece being the London Coliseum (1904). However, he also designed pubs, cinemas and hotels, and the glittering County Arcade, Leeds. It seems remarkable, therefore, with such a successful practice that Matcham never actually qualified as an architect. Westcliff-on-Sea Motor Charabanc Company run the first bus service between the High Street and Hamlet Court Road. Kursaal Kinema Reopens - Post war and the Kursaal is back in business after being occupied by troops. The cinema opened on 26th January with the film 'In Friendships Name' starring Ruth Clifford. 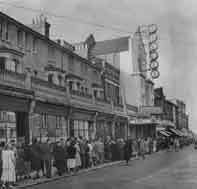 The cinema however was to only survive another 20 years closing in 1940. Pier Hill Cinema Closes - Not the most alluring of the town's cinemas. Closing in 1920 after eleven years in business. It was known as the Grove Picture Theatre. It enjoyed a short time as a Bioscope before closure. It became a billiard hall then taken over by a bus company. Today it does not exist, the footprint having been absorbed into the Royal's Shopping Centre. Rotary Arrives - Southend Rotary Club was founded in 1920 with a healthy membership of 73. N&M Opens - To provide a respite environment for veterans of the First World War, the Naval & Military Club in Royal Terrace opened in 1920. A fine facility with superb views over the Estuary. Belsfield Acquired for School - Southend's Education Committee decided an Intermediate school was needed for boys and girls, to this end Belsfield at 110 Victoria Avenue, a two acre site was purchased at a cost of £7,000. The school was called the Commercial Secondary School and opened on 27th April 1920. Buildings not far away behind the Chelmsford Avenue congregational church were also brought into use. By 1922 372 children were on the school's roll. By August 1921 the school's name was becoming a little confusing so was renamed Westclif High School. Priory Park Opens - Thanks to the bequeavement of the land around the Prittlewell Priory by RA Jones, Priory Park was born. The Refectory and Priory buildings were restored by the Corporation at a cost of £7.500, and the Park was officially opened by H.R.H. the Duke of York, (later King George VI), on 14th July, 1920.